The Beogram 7000 was the last B&O record playing machine. 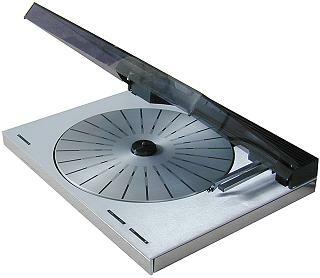 Turntables still had appeal to serious listeners at the time Beosytstem 7000 was withdrawn, but as the company were also stopping the production of “Hi-Fi systems” based around separate functional components, there was no position in the range for further turntables. It was perhaps a shame that the last model should be a lightly-built mid-range offering with little in the way of unique technology or no-compromise quality features or details, given the rich heritage that the designers had access to. Text copyright © Beocentral. Unauthorised reproduction prohibited. The Beogram 7000 itself differed little from the Beogram 6500 that preceded it, and retained the built-in RIAA pre-amplifier. Text copyright © Beocentral. Unauthorised reproduction prohibited.